This is the prequel to the Ten Tiny Breaths series. However, it is recommended that you read this after (at least) the first book. While we know what happened to Kacey before Ten Tiny Breaths, we don't know the entire story of what happened with Trent... until now. In Her Wake tells the heartbreaking story of how one simple mistake can change so many lives. That being said, I was surprised at how many encounters Trent and Kacey had with one another after the accident and before the first book in the series. I think it's safe to say that Trent's grief and desire to make amends with Kacey lead him down a stalkerish path. I was also surprised that Kacey seemed completely oblivious to all of these "chance" meetings with Trent. I suppose that it's easy to explain them away as she was in a period of deep grief. I guess I just wasn't aware of how crafted their meeting in Ten Tiny Breaths actually was. As always, I absolutely loved Tucker's writing. 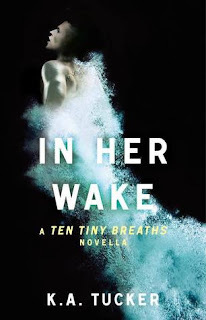 In Her Wake was the perfect ending to Trent and Kacey's story.